Certain email programs (notably Outlook 2007 and 2010) have issues displaying several layers of backgrounds. To maximize compatibility, assume that your primary background color will show up. Make sure the font colors you choose will work with that color. A sidebar layout item may not always display as intended. This is particularly true if it has a separate background color. Instead, you may want to place sidebar details in a regular layout element. This will help improve compatibility. We highly recommend that you stick to the “web-safe” fonts. When choosing a font within a layout block, web-safe fonts are shown in Mail Designer 365 by default. If you choose another font, then it may not display on your recipient’s computer as intended. Export your newsletter as a HTML web page. You can include a link to it in your email, allowing readers with older email clients to read your newsletter in their browser as you intended it to be displayed. 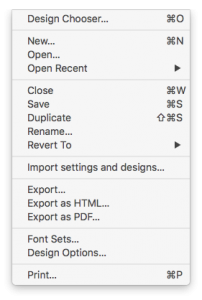 Click File > Export as HTML.